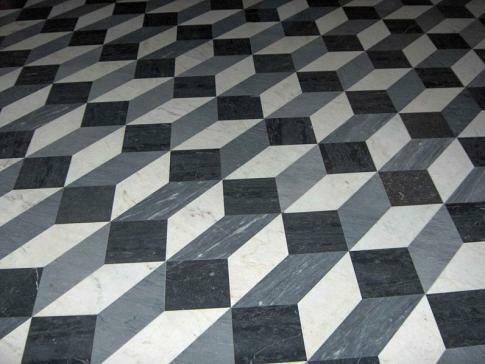 This photograph of the floor tiles in Basilica of St. John Lateran demonstrates an optical illusion that produces a three-dimensional effect. The actual floor tiles are completely flat however the pattern gives the impression of raised boxes. I totally love the jesus optical illusions I LOVE JESUS!!!!!!!!!! I hate hate the one of the two doves andthe two little mexicans I just dont get it (not trying to sound racist)soooooorrrrrryyyyyy!!!!!!!!!!!!!! I appreciate the effect, wish I knew more.